Tap the Medical ID tab at the bottom-right of the screen. Scroll down to see the Organ Donation option. Tap Learn More to find out more about this option, or tap Sign Up with Donate Life to become a donor. 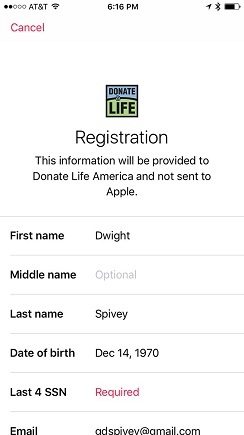 If you tap Sign Up with Donate Life, you’ll be taken to this screen. Enter your information as needed, then tap Continue at the bottom of the page. On the next screen you will be asked to confirm your registration with Donate Life. Tap the Complete Registration with Donate Life button at the bottom of the screen to confirm.